Gymnema sylvestre, a member of the Asclepiadaceae family, is a vine that grows naturally in a wide area including India, Southern China, and Southeast Asia. 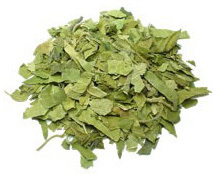 G. sylvestre leaf extract contains triterpenoid saponins called gymnemic acids that are known to inhibit the absorption of sugars in the intestinal tract. G. sylvestre has long been used as a treatment for diabetes.